Going East on M-179 from Gun Lake, the City of Hasting -approx. 10 miles! The Bay Point Inn, is located in the SE corner of the map-located right on the water. 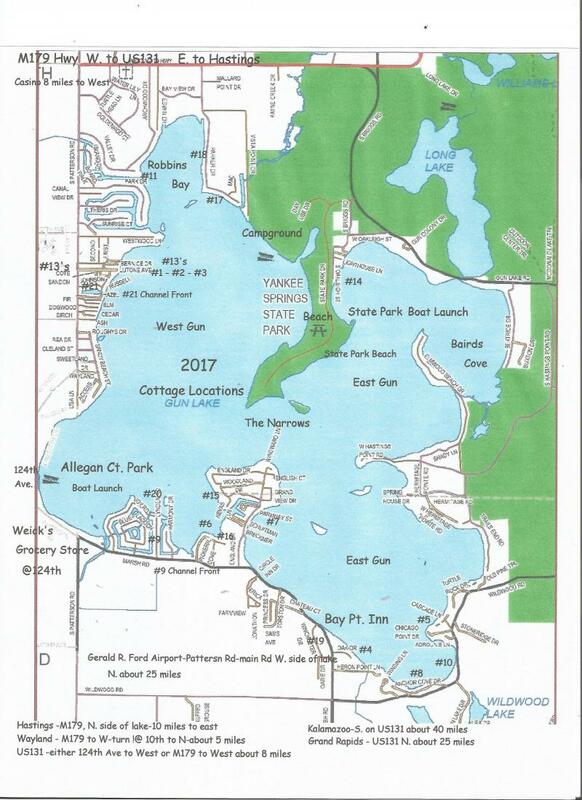 Main road on south side of lake - you would get off US131 at exit 59(Shelbyville) go east on 124th Ave -about 10 miles to lake -you would dead end at Allegan County Park! #1 - #2 - #3 - Lutone Circle - West side of lake - just south of Whispersing Pines Resort. #11- W. Oakleigh - same road as #14 but back to the east -closer to Gun Lake Rd. New Rentals not on Map! also in Whispering Pines Resort-other #13's-except these new units are lake front! Also #17-at top of map-east side of Robbins Bay-cottage faces the main lake not the bay! Pickerel Cove - West of England PT. same road as #16, also on Pickerel Cove!